Protiviti has released its annual report on enterprise risks worrying the corporate boardroom, and across all 10 risks likely to occupy your time in 2019, one theme shines through — unease about corporations moving into a digital world. The report surveyed more than 800 senior executives and board directors around the world, across a host of industries. This is also Protiviti’s seventh annual report, so we can now see how risk priorities are shifting over time. Without question, digital concerns are moving up the charts with a bullet. As usual, DeLoach in his Texas drawl has diplomatically phrased what many audit, risk, and compliance officers know at a gut level: this digital transformation stuff is going to be a bear, and if the company screws it up, you’re sunk. 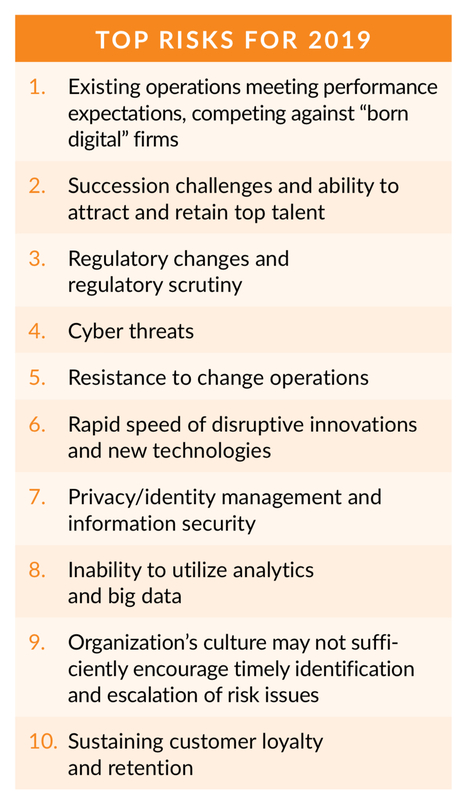 You can see the full list of top 10 risks below, with “Competing against born-digital firms” right at the top. Upon reflection, however, one can see how almost all these risks relate to digital technologies reshaping how organizations work. Regulatory change, cybersecurity, ability to use analytics, sustaining customer loyalty — all of those issues, and more, trace back to life in the digital world, and how well organizations are acclimating to that environment. The Protiviti survey also found that executives expect the global business environment to be “somewhat riskier” in 2019. That is, respondents rated more of the top 10 risks as significant risks this year than prior years. Little surprise, then that respondents also said they’re likely to invest more in risk identification and management next year than they did in 2018. I hear “digital transformation” and the first word that springs to mind is acceleration. When you convert a process from manual to digital operation, you accelerate it. So when we talk about the risks around digital transformation, fundamentally, we’re talking about things move more quickly than senior management can detect, understand, and respond to. So even a risk like No. 10, “Sustaining customer loyalty and retention” — that’s fear that your marketing analytics can’t keep up with customer tastes and perceptions changing constantly in the forge of social media. Or take risk No. 8, “Inability to use analytics and big data.” That’s fear that your risk analysis capabilities aren’t moving as quickly as necessary to keep pace with your changing risk environment. All of digital transformation is about accelerating your business processes, and keeping the agility to respond to an equally fast-changing risk environment. That’s what boards want to achieve, so that’s what risk assurance executives (read: audit and compliance professionals) must deliver. Meanwhile, read the report, and ponder how digital transformation might affect your board’s thinking about those top 10 risks — since inevitably the board will be asking how your function is working to help address them.